Obama intensively put forward his belief in a working democracy. Respect means to debate and to compromise. He looked back to his administration in the United States and to problems where he did not achieve everything, like health care. He criticises rigidity that is too strong to find collective decisions. He asks all of us to be clear on our own core principles and take our time to think about them. But he also demands to recognise that democracy requires taking into account dissent and people with different principles. This means: you never get 100% of your own interests. He seemed to be quite honest about things he did not fully achieve in his administration, though he certainly left out more controversial issues. All of the speech and discussion was highly credible in his belief that every human being is equally important and that democratic leadership is about working for the dignity of all. Consequently, he asks us to focus on problems, on the disadvantaged, and to work on improvements. The first part of the Town Hall was a discussion moderated by Ben Rhodes. It focused on Europe, European politics and integration. It brought forward significant differences in our narratives between Western and Eastern Europe and challenges ahead. But it also pointed to the importance of Europe as a project that is about being never alone again, especially for its smallest members or nations. Last, it made clear that things currently happen that do not represent general values of a majority and that improvements in conversation are necessary. The most important office is citizen! Responsibility in our democracy is nothing we can transfer to an institution. Barack Obama asked anyone in the audience to take up her or his individual responsibility. It starts with voting and reaches further to become active in society and in politics. He explains that there is not ‘the government’ and ‘us’, but that it is all our collective organization and that it about finding ways to improve current situations collectively. It may be negatively interpreted as shifting responsibility away to us. But I tend to take a more optimistic view that is (also) about empowering and integrating. He got some critical questions on what this means in practice. He answered somehow indirect by pointing out that society is sticky and change can be slow or step by step. He also warned to belief in radical change and revolution because of bad historical examples. Asked about current politicians, he sees a need for some to step back and even meditate to find their inner peace. Not easy, given the damaging potential of social media that has emerged during the past years. He was not totally clear on how we all can deal with that. To me, it means using social media for regular communication and information, but stepping back from getting fully absorped by social media. Obama used several explanations to stress the fact that all these platforms are not made to foster democratic debate but to get clicks and to maximize our use of them. Credibility is a key term for him. I recognize that he deeply beliefs in the power of shared values, coherent decision-making, accountability and transparency. He sees our values as similarly or even more important to military power. This leads to his many references to the importance of doing things together, to connect, to network and to leverage efforts. Even the results might be imperfect and never the best 100% solutions. 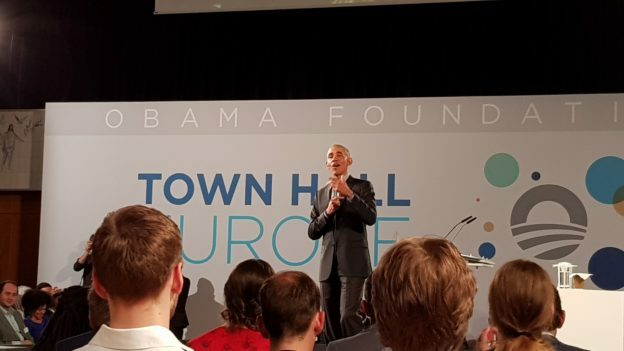 He explains formats like this Town Hall and the work of the Obama Foundation to do exactly this. “If we start losing the ideas, we will have problems no matter what” – Positive leadership always circles around ideas. No matter how difficult it might be, Obama strengthened the importance of ideas. Ideas need to be tested. He ponders on ways to connect the micro level of successful examples to the macro level of broader political issues and change. It is about good stories to tell, formats to network and being open to the use of own good ideas by many others. It’s on all of us – now. It was clear from the very beginning that Barack Obama’s major issue was about motivating all of us in the room and any younger person to take responsibility for future changes. The last part also made clear that he deeply beliefs that a lot of things can be done right now. He is worried about rising inequalities within nations and between nations. To tackle this, he is in favour of higher taxes for the rich and for an increase in state activities for the poor and disadvantaged. He sees a positive value in developing alternative models for society, but sees his and our part more in the here and now and in improving the world as it is right today. The discussion unveils an important part of having a different coherent narrative available for our common future. There was not an answer to what this could be. But a clear message by Obama that change can only happen by our actions today. This is where he especially references the even younger generation like the Fridays for Future movement and calls on us to engage with them in a democratic way. His plea is: Take arguments seriously, for everyone at any time. It was inspiring to me to be part of this crowd and to learn about many different actions today, engaging voices and a joint desire for change. I am honoured to talk to people working on new apps supporting refugees, on educational tools, on ways to reduce food waste, on many efforts of collective improvements of our wellbeing and on new political voices in office. What does it mean for my work in spatial planning? I am sure that the whole event strengthens my belief that there are alternative ways of organizing our spaces – urban and rural ones – today and for everyone of us. Additionally, I even more see the importance of motivating, inspiring, debating – but also about compromising, deciding and finally doing. Some of this belief is held together by the collective efforts on post-growth planning (German ‘Postwachstumsplanung’). I feel supported in my belief that there is an important part to know and think with radical alternative models, but to anchor them in current situations, to question, to (self-)reflect and to improve what we have today. This is pretty much core of Obama’s ‘Yes, we can’ agenda. But it can also be part of a ‘Yes, we plan’ agenda that is active part of leading change in cities and regions. Thanks to Stiftung Mercator for nominating me for this event and to the Obama Foundation for chosing and inviting me. And, most importantly, to the many non-named people who organized the event, cared for technical matters, for security and for the lively atmosphere. Last, thanks to Barack Obama for taking more than 90 minutes to talk with this group and explain his visions and ideas. ← Endlich Wachstum! – und dann?